Also, add 4 strips bacon, cooked. 1. Preheat over to 400˚F. Line a baking sheet with parchment paper. Drain the olives and wipe dry with paper towels. Set aside. 2. Combine the Emmenthaler, flour, butter and cayenne pepper (...and bacon) in a food processor. Cover and process until the mixture is well combined, 10-15 seconds. Add 1 tablespoon water. Process until the dough just holds together when pinched between your fingers, about 10 seconds longer. Add 1 more table spoon water if needed, 1 teaspoon at a time, until the dough holds together. 3. Wrap and enclose each drained olive with about 1 tablespoon dough. Place the coated olives on a prepared baking sheet. Bake until the olive balls are lightly browned, 15-20 minutes. Serve Warm or at room temperature. *Recipe modified from Great American Home Baking. This is a MUST try!!! YUM YUM YUM!! !, and I voted no 5, YAY!!! .i disagree with the fact that anything worth clicking pics is never healthy!! presentation makes any dish look fab!! but i must say u r quite a cook :)..
Olive poppers look dayum delicious!! 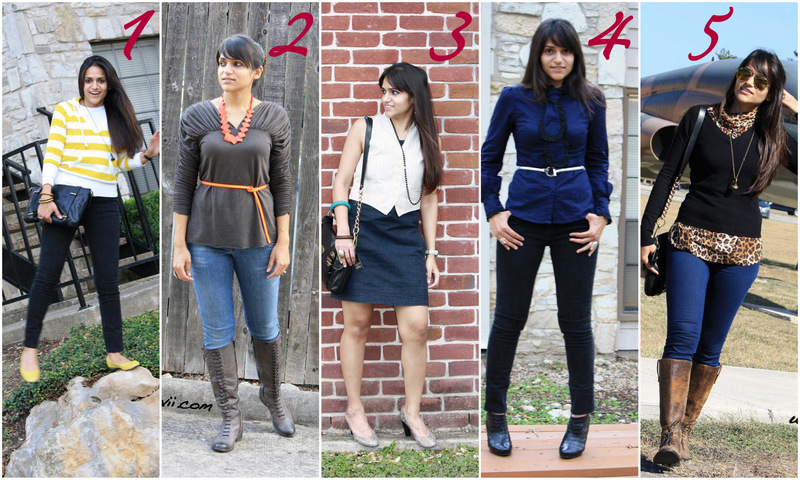 I vote #4 but the cardigan in #1 is too fun! You're doing a great job with the 30 for 30 challenge! Cute outfits! 4 and 5 are my favorites:) Omgosh, these look so delicious! I must try this! Thx for sharing! Love olives, this is something new to try! Had a hard time voting my fave, 1 or 5?!!!! you gorgeous in all of 'em! I love how these are called olive poppers! I had a tough time between # 4 and # 5-I think both are amazing looks and I love how you styled those outfits. Actually I love the entire row! And olive poppers? wow I have not tried them but I love green olives so I know I would love these. woahhh looks oh soooo yummy !! hmmm.must give this one a try..since am on a cooking spree presently!! Wow those olive poppers look SO YUM. Definitely gonna give them a go! Thanks for sharing this yummy recipe! Love looks #4 and 5! Just voted for my fav outfit. I'm not an olive fan, but these do sound yummy. No 5 is a fave of mine and is that an aircraft I can see in the background? SERIOUSLY! HOW COOL IS THAT! I love those olive roll things! I am so making those! I also wanted to say before, I love the pics with you by the plane~ Pretty awesome! I couldn't vote. I can't decide between 1 and 4. And these olive poppers sound delish. I could eat olives in any form. I'm sure I would love these! I like your fourth and fifth outfits the best mostly because I love anything black and navy and I'm a sucker for a splash of leopard print! You look totally gorgeous in all of the looks though. Those olive poppers look delicious. I don't know you could have the will power to give them away! I've had jalapeno poppers a lot but never olive ones. I must try them!! I liked both 4 & 5 tough choice between the two. Those olives look good. YUM. I have an olive tattooed on my shoulder, and that's how much I love this post. I loved 1,2,3,4 and 5th pic. Though it was difficult to choose i voted for 1st. Liked the name of the dish. We name you Fabulous n Stylish home-maker. i LOVE olives. This is so totally yum! I love #5 the best so far! As for olive poppers - I hate olives. I hate them with a passion. I think, being Serbian, I am supposed to love them, but I can't stand the taste or texture. That being said, if I WERE going to eat one, I think poppers would be the way to go! Do your talents ever end? ...I don't think so and I'm glad! 2, 4, 5... love these looks! Hard to choose a favourite but if I had to it would be 4. No. 5. Hang on. 3. No definitely 4. By the way, voting is hard you know..there's always TWO i have a hard time comparing with which i like more..